Hospitals and healthcare providers have dozens of systems-related responsibilities: from patient check-ins to behind-the-scenes documentation. For most facilities, orchestrating the revenue cycle management can be a relentless drain on resources. But with so much on their plates, more hospitals are considering outsourcing their RCM – or at least a part of it. 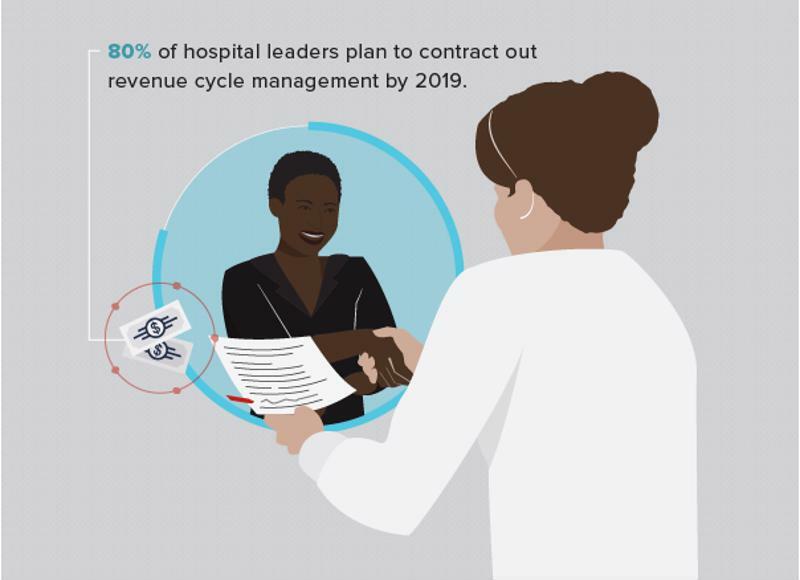 According to a recent survey by Black Book Research, 80 percent of hospital leaders made up of C-suite, hospital boards and senior managers plan to contract out for revenue cycle management by next year. Organization is critical to successful revenue cycle management. If there isn't smooth coordination, your facility may have trouble translating services into billing codes, generating professional claims and more. RCM must always be given a high priority; you should dedicate a team to make sure front end and billing processes are done as accurately and efficiently as possible. Contracting out RCM ensures all factors will be taken care of and positively impact the businesses' key performance indicators. Hospital leaders recognize the benefits of outsourcing revenue cycle management. Your facility may need assistance with RCM if KPIs include bad debt, charity, cash-to-net revenue, percentage of claims made on first pass and more. Certainly, some hospitals may disregard the idea of hiring a third-party organization to take care of RCM due to monetary reasons, but long-run revenue will outweigh upfront costs of outsourcing, according to Melissa Scott, director of advisory services at a healthcare technology company. As technology continues to transform and digital advancements emerge, businesses are relying on automation services now more than ever. Hospitals may invest in a piece of technology to handle RCM, but trusting solely in the system can potentially hurt the organization's bottom line. According to Healthcare Finance, relying on technology can hinder overall performance and break up the steady workflow established by staff members when systems go down. "Relying on technology can hinder overall performance." Instead, hospitals and facilities should use technology as a complementary resource to a third-party RCM team. Hiring professionals to take care of this responsibility can ensure nothing falls through the cracks while keeping the workflow of key staff members steady. All in all, outsourcing RCM improves quality and patient safety and encourages enhancement in the company's bottom line. If your facility is facing the previously stated issues, it may be time to consider outsourcing. PROMEDICAL is a national healthcare revenue cycle management company working to provide the healthcare community with a client-focused and technology-driven revenue cycle partner. By partnering with PROMEDICAL, you can ensure proper reimbursement, timely resolutions and increased revenue for your facility. For more information about our services, contact PROMEDICAL today.